Maharaj was born in the outskirts of Mumbai in 1920 on the auspicious day of Dattatreya Purnima in the month of Marga Sirsha. He appeared in a family of Vaishnavas since 8 generations. 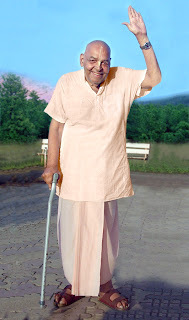 Maharaj performed His disappearance pastime on 25th January 2010 in Mumbai, India at the age of 91. Highly educated, with M.A degrees in both English and Sanskrit, Maharaj were effectively multilingual in Marathi, Hindi, Gujarati (his native tongue), Urdu, Sanskrit and English. Since childhood, Maharaj were always filled with a burning desire to understand the Vaishnava traditions and practices he grew up with in his village. His mother would always tell Maharaj as a boy to offer his dhoti, and everything else he possessed to Lord Krishna before wearing it, but she could not explain why he should do it when he asked her so. He would never get satisfying answers to his queries; instead the village temple priest labeled him 'the troublesome one" and would scoot him off whenever he came to the temple! Maharaj's quest for spiritual knowledge continued even in his student days, when he attended Gandhiji's Prathana’s at the Hanging Gardens, Mumbai. After marriage, Maharaj left India in 1955, when he moved his family to Aden and then to London, where he would stay for the next 35 years of his life acquiring British citizenship. Despite all his family commitments, (he had 3 children by his marriage), Maharaj always remained absorbed in his quest for the Absolute Truth, by constantly reading and chanting Bhagavad Gita and Srimad Bhagavatam. 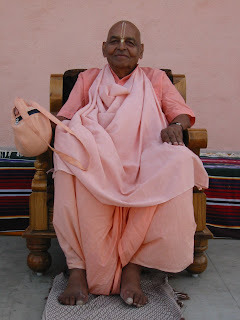 Born and bred in a pure Vaishnava family, he was, since birth, above material contamination, effortlessly abiding by the regulative principles of Sastras. Lord Krishna responded to Maharaj's devotional service when one morning along Oxford Street London, Maharaj, as a householder chanced upon a group of Hare Krishna devotees chanting and dancing in the busy street intersection. Despite his erudite scholarship and Vaishnava birth, Maharaj had been searching for a deeper understanding and taste of devotional service, and the sight of these dancing devotees chanting the Lord's Holy Names with sincerity attracted him, and soon he was invited to attend the Hare Krsna programmes at the Bury Place Temple, London. There, Maharaj heard a young European Vaishnava Hare Krishna Das expertly preaching the philosophy of Krsna consciousness and Srimad Bhagavatam. Impressed Maharaj inquired where this young Western Vaishnava had learnt so much, and he replied simply, "Everything is in Srila Prabhupada's books." Thus began Maharaj's introduction to Srila Prabhupada through his transcendental writings. Maharaj would daily spend 3 -4 hours in the Bhaktivedanta Manor's temple library, and became very absorbed in reading and dissecting Srila Prabhupada's books. At long last, he was getting deeply satisfying realized and authoritative answers to all his life-long questions! Maharaj first took darshan of Srila Prabhupada in 1973 when, as President of the London Gujarati Community Society, he invited Prabhupada to be guest-of-honour at the society's annual function. There Srila Prabhupada's lecture marked the turning point in Maharaj's life. Srila Prabhupada had stated that whenever we meet our friends, we ask them so many material things, like how is your business, your family etc. But this is simply a waste of time. If we really cared for them, then when we meet them, we should ask them how far they have progressed, since we last met, in the matter of stopping the repetition of the cycle of birth and death. Srila Prabhupada's pure and powerful teaching touched Maharaj's heart and awakened further his self-realisation. From then on, whatever daily devotional service Maharaj had performed, he increased it manifold in quality and quantity, and would take Prabhupada's association whenever he was in London. On one such occasion, Prabhupada instructed Maharaj, "You are a Sanskrit scholar? You should take sannyasa and preach my message of Krishna Consciousness for the benefit of mankind". And so it was, that through the years, Maharaj enshrined Srila Prabhupada's instructions in his heart, fulfilled all his family affairs very responsibly and the Lord made all the arrangements for him to enter retired (vanaprastha) life in 1980, where he took up residence in ISKCON Soho Street Temple, London, and received initiation in 1981, as "Mahavishnu Das Vanachari". For 8 years, Maharaj deeply and lovingly absorbed himself in Srila Prabhupada's books and would spend hours summarizing the 9 cantos of Srimad Bhagavatam into 6 detailed notebooks. Devotees who witnessed Maharaj's studying Srila Prabhupada's books can even now recall the temple pillar in the temple room which became known as Maharaj's seat, where he would sit for hours unabated in his concentration and study. During that time, Maharaj not only became a source of knowledge for devotees, but also with his age, wealth of experience in the ashrams, someone that all devotees could turn to for counselling, help and just plain good association. In 1991, Maharaj accepted his second initiation and the renounced order of life (sannyasa) on the auspicious appearance day of Lord Narasimha from H.H Sivaram Swami, and became known as H.H Mahavishnu Gosvami Tridandi Sannyasi". Since 1991, Maharaj has travelled and preached tirelessly, while completing 12 world tours. In so doing, he has inspired and transformed the lives of thousands of devotees from all walks of life all around the world. 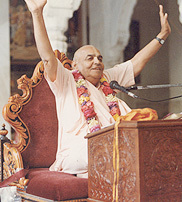 In 1991, he conducted one of ISKCON's 1st Srimad Bhagavatam Bhagavad Saptahas in Vrndavan, lecturing for 6 hours continuously each day for 7 days. In 2002, at the advanced age of 82 years, he conducted Bhagavad saptaha in Sydney, Australia, and lectured for 4 hours daily for 7 straight days. In 1996, Maharaj took another significant step in his preaching efforts when he arrived in the Holy Dham of Dwaraka with the intention of establishing Srila Prabhupada's missionary activities there. In the 1st few months of his arrival, Maharaj and a few of his disciples spent and stayed in the open dry desert land on the outskirts of Dwaraka, reading Srimad Bhagavatam and conducting simple programmes. In 1998, temple construction commenced, and in 2003, ISKCON's 1st temple made completely in stone and in accordance with our ancient Vedic heritage was completed amidst great celebrations. In that same year, in January 2003, Maharaj travelled to the bustling Saurasthran city of Rajkot and with the help of nice senior devotees, commenced and completed the construction of a 12 room guesthouse and beautiful temple and ashram - ISKCON Rajkot was born on a sprawling 5 acre land - with many more spiritual projects in the pipeline. Despite his advanced age, his frail health, and his hectic preaching tours and powerful and pure preaching, Maharaj were still accessible to everyone, even the little child who comes to play at the temple ground. He still insisted on washing his own clothes, and cooking his own meals. To many devotees around the world, whether they are his disciples or not, Maharaj were the kind loving spiritual father that we all can turn to inspire us in our moments of spiritual struggle, and guide us in this age of quarrel and strife. Truly, H.H Mahavishnu Goswami is a beacon of light in a darkened world. May we all join hands in participating to help fulfill this pure desire of Maharaj - to spread the message of Srila Prabhupada and Krsna Consciousness.